Top line machines bring so many new features that it can be daunting to learn how to use them to the fullest. To assist with that we have created New Owner bundles for the Janome Memory Craft 15000 and the Janome Memory Craft 12000. 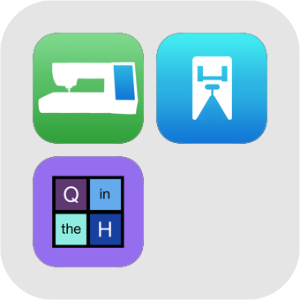 These bundles contain the comprehensive reference app (My 15000 or My 12000), our ultimate Janome presser foot reference FootBook, and our latest app that lets you create beautiful quilts on your iPad, Quilt in the Hoop. Each bundle price is substantially discounted from the total price of its components. If you already own at least one of the programs in the bundle you can use the "Complete My Bundle" option to purchase the remaining apps for the difference in the bundle price and what you have already paid. Details on how to complete your bundle are available here.